"Duel in the Extreme Domain" is the forty-fifth episode of the Yu-Gi-Oh! VRAINS anime. It first aired in Japan on March 28, 2018, and aired in Canada on February 2, 2019. Varis continues to assault Playmaker with his fierce attacks. 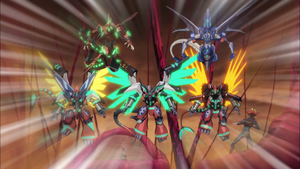 Playmaker tries to mount a counterattack using multiple "Code Talker" monsters. However, Varis uses his ace monster, "Borreload Dragon", to counter that. Varis then sets up the ultimate battle formation that transcends human intellect itself, and drives Playmaker into the abyss of despair. As Varis controls a "Borrel" Link Monster, he activates the effect of "Miniborrel Dragon" in his GY, Tributing a Link-3 monster he controls to Special Summon it from his GY (800/←→). He Tributes "Transcode Talker". As "Topologic Bomber Dragon" is no longer co-linked to "Transcode Talker", it loses 500 ATK ("Topologic Bomber Dragon": 3500 → 3000 ATK). Varis activates the effect of "Link Turret" twice, removing a Rokket Counter from "Link Turret" to Special Summon a "rokket" monster from his GY in Defense Position for each counter removed. Their effects are negated, but they are banished when they leave the field. He removes two Rokket Counters ("Link Turret": 5 → 3 Rokket Counters) to Special Summon "Metalrokket Dragon" (1700/1400) and "Shelrokket Dragon" (1100/2000). The effect of "Boot Sector Launch" increases the ATK and DEF of "Rokket" monsters by 300 (Metalrokket: 1700/1400 → 2000/1700; Shelrokket: 1100/2000 → 1400/2300). Varis uses "Shelrokket", "Metalrokket" and the Link-2 "Miniborrel Dragon" to Link Summon "Borrelguard Dragon" (3000/↑↓↘→) to the zone the middle-left Link Arrow of "Borreload Dragon" (3000/←↙↘→) points to. Varis activates the effect of "Borrelguard Dragon", sending a Spell/Trap Card from his Spell & Trap Zone to the GY to Special Summon a monster that was destroyed by battle this turn from the GY with its effects negated. He sends "Mirror Force Launcher" to the GY to Special Summon "Powercode Talker" (2300/←↙→). Varis activates the effect of "Miniborrel Dragon", Tributing "Powercode Talker" to Special Summon it from his GY (800/←→). Varis activates the effect of "Link Turret", removing two Rokket Counters ("Link Turret": 3 → 1 Rokket Counter) to Special Summon "Magnarokket Dragon" (1800/1200 → 2100/1500) and "Shelrokket" (1100/2000 → 1400/2300). Varis uses "Magnarokket", "Shelrokket" and the Link-2 "Miniborrel Dragon" to Link Summon "Borrelsword Dragon" (3000/←↙↓↑) to the zone the middle-right Link Arrow of "Borreload Dragon" points to. Varis activates the effect of "Borrelguard Dragon", sending "Mirror Force" from his Spell & Trap Zone to the GY to Special Summon "Excode Talker" (2300/←↑→). Varis activates the effect of "Link Turret", removing a Rokket Counter ("Link Turret": 1 → 0 Rokket Counters) to Special Summon "Anesthrokket Dragon" (0/2200 → 300/2500). Varis uses "Anesthrokket" and the Link-3 "Excode Talker" to Link Summon "Topologic Gumblar Dragon" (3000/↑←↓→) to the second Extra Monster Zone, creating an Extra Link. As "Topologic Gumblar Dragon" is Extra Linked, Varis activates its effect to destroy all cards in Playmaker's hand, then inflict 3000 damage to Playmaker, but Playmaker activates his face-down Continuous Trap Card "Drop Frame Wedge". For every card sent from Playmaker's hand to the GY, the damage is halved an equal number of times. Playmaker sent two cards from his hand to the GY, so the damage is quartered (Playmaker: 800 → 50 LP). While "Drop Frame Wedge" is on the field, monsters cannot attack. "Drop Frame Wedge" is destroyed at the end of a number of Playmaker's turns equal to the number of cards discarded, in this case two. If "Drop Frame Wedge" leaves the field because of Varis' card effect, it negates the effects of Varis' monsters and destroys them. During the End Phase, as "Autorokket Dragon" was destroyed and sent to the GY this turn, Varis activates its effect to Special Summon a "rokket" monster with a different name from his Deck. He Special Summons "Magnarokket" (1800/1200 → 2100/1500). As "Link Turret" has no Rokket Counters, it is sent to the GY. Varis Normal Summons "Autorokket" (1600/1000 → 1900/1300). Varis activates the effect of "Borreload Dragon", decreasing the ATK and DEF of a monster on the field by 500. Varis targets "Autorokket". As a Link Monster's effect is activated targeting "Autorokket", Varis activates its effect, destroying it, then sending a Spell/Trap Card on the field to the GY. Varis sends Playmaker's Set card. Varis Sets a card. During the End Phase, as "Autorokket" was destroyed and sent to the GY this turn, Varis activates its effect to Special Summon a "rokket" monster with a different name from his Deck. He Special Summons "Anesthrokket" (0/2200 → 300/2500). As there are two monsters in the Extra Monster Zones with the same Link Rating, Playmaker activates the Spell Card "Arrow Charge" to draw two cards and reveal them, but he must banish any of those drawn cards during the End Phase if they are still in his hand. He draws "Disconnect Linker" and "Transaction Rollback". Playmaker activates the Spell Card "Disconnect Linker" to Special Summon a Link-2 or lower Link Monster from his GY with its effects negated, then Link Summon using it as Link Material. He Special Summons "Restoration Point Guard" (1000/←↙) and uses it to Link Summon "Secure Gardna" (1000/→) to an unknown zone. The Link Monster Link Summoned by the effect of "Disconnect Linker" is unaffected by Varis' card effects, and as long as that monster is on the field, monsters in the Extra Monster Zones cannot attack. Playmaker Sets "Transaction Rollback". As it is Playmaker's second End Phase after the activation of "Drop Frame Wedge", it is destroyed. This page was last edited on 6 April 2019, at 10:59.